OU CAN'T drink around Mike Pence. No drinking! Stop that!! You most definitely cannot twirl your skirt in his vicinity. Don’t twirl your skirt! You know perfectly well what’s under there, and so does Mike Pence!! And for heaven’s sake, no dancing! Dancing is not okay, for the love of God!! Don’t you even think about swearingHEY! Did you just swear?! What did we say about swearing!! Drugs are the devil’s playground. His playground!! NO DRUGS AROUND MIKE PENCE!! Are you out of your mind??!! No dancing means no music! This includes KATY PERRY!! Unless she’s singing hymns like she did for those nuns. Katy Perry may sing hymns around Mike Pence. Do not allow your dogs to greet one another when Mike Pence is near. You know what happens when dogs say hello! They sniff at each other andoh, it’s disgusting!! You know it is!! How could you?!! You may read aloud from your bible around Mike Pence. But only from the King James translation. Modern translations encourage modern sinning, which is the worst kind of sinning!! Don't think you can just wantonly read your modern translations in front of Mike Pence, because you can't!! 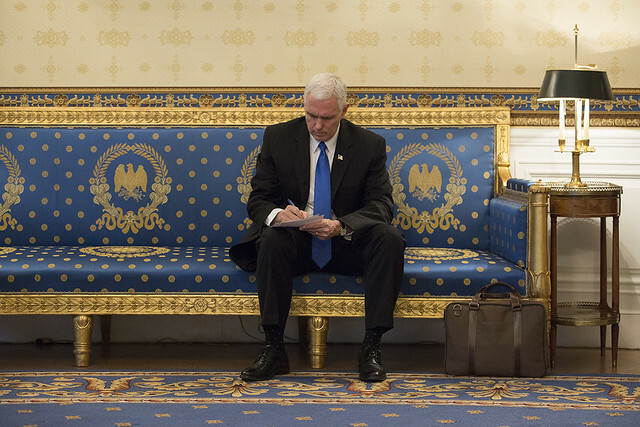 It is acceptable to pray around Mike Pence, as long as you are praying to the Father, the Son, and/or the Holy Ghost. Praying to Mary is stretching it a bit. Please look up from time to time to see how Mike Pence is taking it. Adjust accordingly!